What Kind of Clothing Do Cowboys Wear? Cowboy boots were invented by cowhands moving cattle westward after the Civil War. 3 What Kind of Clothing Do Cowboys Wear? According to folklore, cowboy boots were invented when a cowboy came in to a shoemaker's shop and asked for a pointy-toed boot that was easier to put into the stirrup, had a higher shaft to keep mesquite thorns from scratching his legs, and an underslung heel that wouldn't come out of the stirrup during rough rides and made it easier to dig into the ground when dealing with a recalcitrant horse. Today's boots are varied and suit different duties of today's modern wearer. Western cowboy boots evolved out of the Army-issue boots given to Union soldiers during the Civil War. Finding the boots ill-suited to cattle drives, cowhands began requesting that the toe be pointed, and the heel be at least 1 inch high. 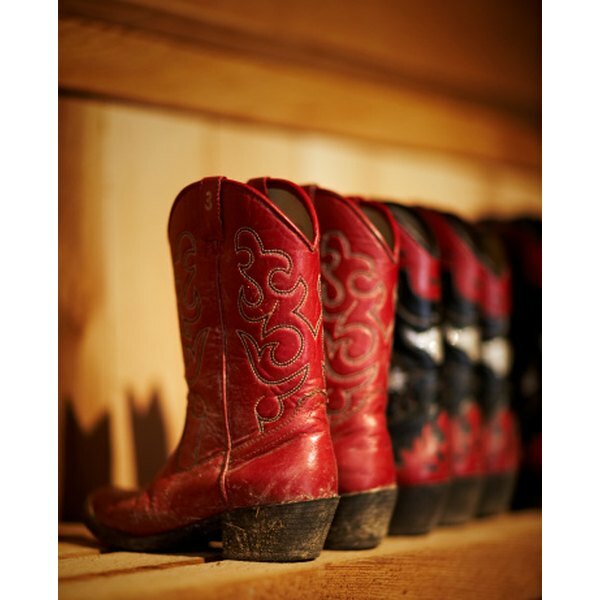 Cowboy boots had an added benefit of being easy to re-sole and re-heel giving them not only practicality but longevity. There are two types of heels with the cowboy boot, riding and walking, with the walking heel being set at a slightly different angle and significantly lower. The sole of the Western boot is noticeably higher than the toe to accommodate a stirrup. Western boots have a shaft that ends just below the knee to protect the wearer from the harsh conditions of working on the range. Ropers are noticeably shorter than the regular cowboy boot and have a lower heel with a less articulated arch. Where the dress and working cowboy boot has a distinctly higher heel which makes it ideal for fitting into the stirrup and giving the wearer better traction, the roper is made with a wide heel that is shaped for the heel but with an almost square shape. This is because cowboys need to dismount quickly when roping and do not want to risk breaking off a heel in the fast-paced action required by roping a steer. Ropers are strictly working boots and do not come customized. 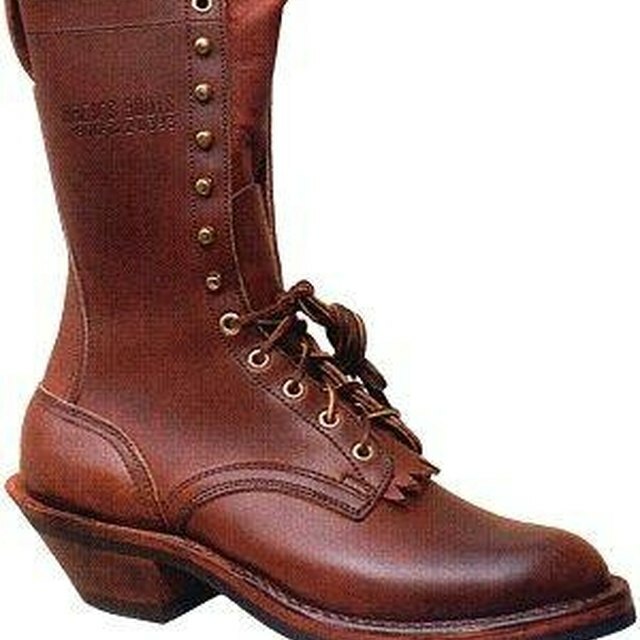 Ropers are similar to paddock boots, and are long lasting and practical. Cowboy boots became an expression of identity for the wearer. Boots became more stylized with fanciful colors. As working cowboy boots were made of leather, customized boot makers began to choose exotic skins and boots today can be made of snake, lizard, eel, alligator, deer skin, stingray, elephant, lizard and ostrich -- among many others. Customized boots are not cheap -- makers like J.B. Hill, Bad Dog Custom Boots and Back at the Ranch charge a premium. Works of art, customized boots have been given as gifts to heads of state, including Harry S. Truman. Cowboy boots were taken in by haute couture and created into something completely different: fashion boots. Fashion boots come with a significantly higher heel and are usually tailored to fit a woman's leg and feet. Fashion boots are not usually made for walking but instead are designed to set the wearer apart from the everyday world of shoes. Boots of this nature are usually not customized to express identity with any particular group. Still, the roots of the fashion boot are still the humble cowboy boot and its simple shape and design can be seen in the most elaborate of boots. What Are the Dangers of Wearing Ugg Boots?